Christina Penescu was born in Bucharest, Romania, 1988. Her family relocated to California when Christina was a year old. Since early childhood, her passion for art and nature was very apparent. As a child she loved to collect books about animals and spend her time outside in nature. Cristina has experimented with a variety of mediums and styles and recently has made the transition to realistic wildlife art, which she feels has always been her true calling in life. 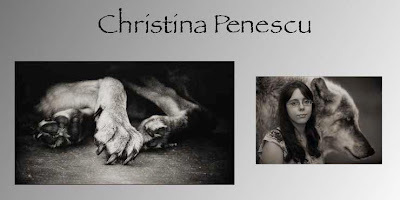 She enjoys painting a wide variety of wildlife subjects, however wild canids, especially wolves, hold a special place in her heart and have been a recurring theme in her art since childhood. Cristina is has had no formal training and is a self-educated artist. She has experience working in a variety of mediums, however she prefers acrylic and scratchboard. Her artwork is very detail oriented and she aims to bring the viewer an up close, intimate look at nature. She hopes to inspire the world through her depictions of the natural beauty around us. Cristina is currently at the beginning of her career as a wildlife fine artist but has already begun to carve a niche for herself in the field. She recently was accepted as a Signature Member of the world-renowned Society of Animal Artists. Cristina is also a member of Artists for Conservation and the Marwell International Wildlife Art Society. 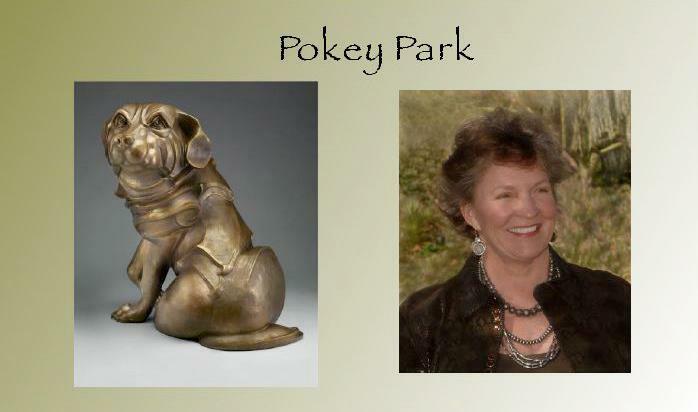 Pokey Park (Marie Whittle-Webb Park) was born and spent her formative years in Coastal Georgia. Pokey's earliest memories are the play of light and shadow in the live oak forest, the designs in driftwood and shells, the patterns created by wind and tide, the dance of wild animals, the flight of birds, and the force of storms. Those early impressions have greatly influenced her art and life. Pokey spent 33 years in the Pennsylvania countryside and the Massachusetts Coast, sailing waters from Chesapeake Bay to Nova Scotia all the while studying plants and wildlife, drawing and creating sculptures from those images. She has traveled the far reaches of the earth and loves most to embrace things that radiate honesty, kindness, and openness. As a transformer of energy, Pokey captures the essence of life forces in her bronze sculptures. She has a BFA from the University of Georgia where she first experimented with bronze casting under Leonard DeLonga. She also works in clay, wood and stone. Pokey taught art to both adults and children when she lived on the East Coast. She now divides her time between Tucson, Arizona and Ridgway, Colorado. Her work ranges in scale from a few inches to more than ten feet and has been enlarged or downsized for site specific commissions. Pokey has public installations in Pennsylvania and Massachusetts and her work is in private collections across the United States. His works have been exhibited and purchased by many prestigious museum, corporate and private collections. A very impressive list can be found on his website.